Update: A full-length video of the show is now available on youtube. A full room gave a standing ovation to Climate Cabaret's first performance at the Fahs Theater in Princeton. The show offered wit, insight and beauty in theatrical sketches and songs about the defining issue of our time. and featured an appearance by Titania from Shakespeare's Midsummer Night's Dream, who warned of a "distemperature". Climate Cabaret standards like "Earth Logic in Space" and "Carbon Dating" mixed with more recent sketches: "Headed for a Cliff" and "The Tense Family." Midway through we debuted Sam Russell's new film, "The King's Speech on Climate Change," which grew out of our climate-adaptation of The King's Speech, and stars our own Fred Dennehy. Performing were Cheryl Anne Jones, Basha Parmet, Fred Dennehy, and Steve Hiltner. 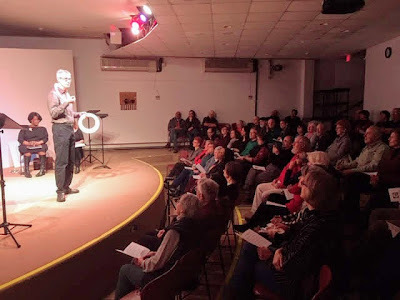 Thanks to Dunbar Birnie and the Unitarian Universalist Congregation of Princeton for sponsoring and hosting the performance, and to the local chapter of Citizens' Climate Lobby for their support and inspiration. Thanks also to Perry Jones and Alison Cote for lighting assistance, and videographer Chuck McEnroe for documenting the evening.